Chaim Weizmann, who was a science professor before becoming Israel's first president. Chaim Azriel Weizmanz (Hebrew: חיים עזריאל ויצמן, November 27, 1874 – November 9, 1952) was a chemist, statesman, President of the World Zionist Organization, first President of Israel (elected February 1, 1949, served 1949-1952) and founder of a research institute in Israel that eventually became the Weizmann Institute of Science. Weizmann was not only Israel's first President but, from 1918 onwards, he played a major role in events that would eventually lead to the nation's birth. When Israel declared its independence, a life's dream was realized for this champion of his people's right to a safe and secure home in the land of their ancestors. Unfortunately, other people also had a claim on the same land and subsequent to the creation of the modern state of Israel, conflict has continued between the State of Israel and the Palestinian people. Weizmann himself made an early effort at Jewish-Arab collaboration. Had that effort succeeded, history may tell a different story. Weizmann had a dream and worked all his life to see the dream become reality. Weizmann was born in the small village of Motol (Motyli, now Motal') near Pinsk (Russian Empire, now in Belarus) and graduated in chemistry from the University of Fribourg in Switzerland in 1899. He lectured in chemistry at the University of Geneva (1901-1903) and later taught at the University of Manchester. He became a British subject in 1910, and in World War I, he was (1916-19) director of the British Admiralty laboratories. He became famous because he discovered how to use bacterial fermentation to produce large quantities of desired substances and is nowadays considered to be the father of industrial fermentation. He used the bacterium Clostridium acetobutylicum (the Weizmann organism) to produce acetone. Acetone was used in the manufacture of cordite explosive propellants critical to the Allied war effort. Weizmann transferred the rights to the manufacture of acetone to Commercial Solvents Corporation in exchange for royalties. He was married to Vera Weizmann. The couple had two sons. The younger one, Flight Lt Michael Oser Weizmann (d. 1942, aged twenty-five), serving as a pilot in the British No. 502 Squadron RAF, was killed when his plane was shot down over the Bay of Biscay. Weizmann lectured in chemistry at the University of Geneva between 1901 and 1903, and later taught at the University of Manchester. He became a British subject in 1910, and while a lecturer at Manchester he became famous for discovering how to use bacterial fermentation to produce large quantities of desired substances. He is considered to be the father of industrial fermentation. He used the bacterium Clostridium acetobutylicum (the Weizmann organism) to produce acetone. Acetone was used in the manufacture of cordite explosive propellants critical to the Allied war effort (see Royal Navy Cordite Factory, Holton Heath). Weizmann transferred the rights to the manufacture of acetone to the Commercial Solvents Corporation in exchange for royalties. First Lord of the Admiralty Winston Churchill became aware of the possible use of Weizmann's discovery in early 1915, and Minister of Munitions David Lloyd George joined Churchill in encouraging Weizmann's development of the process. Pilot plant development of laboratory procedures was completed in 1915 at the J&W Nicholson & Co gin factory in Bow, London, so industrial scale production of acetone could begin in six British distilleries requisitioned for the purpose in early 1916. The effort produced 30,000 tonnes of acetone during the war, although a national collection of horse-chestnuts was required when supplies of maize were inadequate for the quantity of starch needed for fermentation. The importance of Weizmann's work to the ongoing war effort encouraged Foreign Secretary Arthur Balfour to issue the Balfour Declaration of 1917 in support of Weizmann's Zionist objectives as Weizmann ascended to the presidency of the British Zionist Federation. After the Shell Crisis of 1915 during World War I, Weizmann was director of the British Admiralty laboratories from 1916 until 1919. During World War II, he was an honorary adviser to the British Ministry of Supply and did research on synthetic rubber and high-octane gasoline. (Formerly Allied-controlled sources of rubber were largely inaccessible owing to Japanese occupation during World War II, giving rise to heightened interest in such innovations). I trust and feel sure in my heart that science will bring to this land both peace and a renewal of its youth, creating here the springs of a new spiritual and material life. [...] I speak of both science for its own sake and science as a means to an end. His efforts led in 1934 to the creation of the Daniel Sieff Research Institute, which was financially supported by an endowment by Israel Sieff in memory of his late son. Weizmann actively conducted research in the laboratories of this institute, primarily in the field of organic chemistry. In 1949 the Sieff Institute was renamed the Weizmann Institute of Science in his honor. In 1917, during World War I, Weizmann worked with Lord Balfour on the Balfour Declaration. He had first met Balfour as early as 1906, the year that Britain offered Uganda as a possible location of a Jewish homeland. During that first meeting, Balfour was impressed by Weizmann's personality, and asked him why Palestine—and Palestine alone—could be the basis for Zionism. "Anything else would be idolatry," Weizmann protested, adding, "Mr. Balfour, supposing I were to offer you Paris instead of London, would you take it?" "But Dr. Weizmann," Balfour retorted, "we have London," to which Weizmann rejoined, "That is true, but we had Jerusalem when London was a marsh." As a chemist, Weizmann had invented a process to produce cordite without using calcium acetate, which Germany possessed and Britain did not. Without cordite, Britain may have lost World War I, so Weizmann's process was necessary for the war effort. When Balfour asked what payment Weizmann required for the use of his process, Weizmann responded, "There is only one thing I want: A national home for my people." He eventually received both payments for his discovery and a role in the history of the origins of the state of Israel. The Balfour Declaration of November 2, 1917, committed the British Government to assisting in the creation of a Jewish homeland within what was then the Ottoman territory of Palestine, part of the province of Greater Syria. Anticipating victory over the Ottomans, the French and the British had already staked their claims to those territories in which they had particular interests, whether strategic, commercial, or both, in the Sykes-Picot Agreement of May 16, 1916. Britain was to administer Palestine, so the Balfour Declaration was more than a paper promise. Britain, however, had also made certain promises regarding territory to the Sharif of Mecca, Emir Hussein, so in the post-war context, Britain had to work out a compromise. 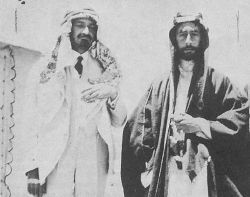 Emir Faisal I and Chaim Weizmann (left), wearing Arab garb as a sign of friendship. Photograph taken in 1918. On January 3, 1919, he and the future King Faisal I of Iraq signed the Faisal Weizmann Agreement establishing relations between Arabs and Jews in the Middle East. Weizmann knew that Arab support would significantly help the process of increased Jewish settlement in Palestine. Faisal, expecting to be rewarded with significant territory in return for aiding the British, agreed to support Jewish settlement in return for Jewish aid in establishing the infrastructure of what he believed would be a very large Arab state. Prudence suggested that the international Zionist movement could prove to be a useful ally, given the skills and wealth of many of its members. The Emir was not especially concerned about the views of Arabs in Palestine, who would actually oppose the Balfour Declaration and the subsequent British Mandate of Palestine. Effectively, the Agreement only lasted a few months, since this relationship did not survive the Paris Peace Conference, 1919, at which Weizmann led a Zionist delegation pleading for a homeland in Palestine and Faisal an Arab delegation pleading for an independent Arab state including Palestine. The preference on the part of the Jews for a British Trusteeship is unquestionably the result of the peculiar relationship of England to he Jewish Palestinian problem. The return of the Jews to Zion has not only been a remarkable feature in English literature, but in the domain of statecraft it has played its part, beginning with the readmission of the Jews under Cromwell II manifested itself particularly in the 19th century in the instructions given to British Consular representatives in the Orient after the Damascus Incident; in the various Jewish Palestinian projects suggested by English non-Jews prior to 1881; in the letters of endorsement and support given by members of the Royal Family and Officers of the Government to Lawrence Oliphant; and finally, in the three consecutive acts which definitely associated Great Britain with Zionism in the minds of the Jews, viz - The El Arish offer in 1901; the East African offer in 1903, and lastly the British Declaration in favor of a Jewish National Home in Palestine in 1917. Moreover, the Jews who have gained political experience in many lands under a great variety of governmental systems, whole-heartedly appreciate the advanced and liberal policies adopted by Great Britain in her modern colonial administration. The newly formed League of Nations ratified the British Mandate for Palestine on July 24, 1922. The mandate required Britain to "secure the establishment of the Jewish national home" while at the same time "safeguarding the civil and religious rights of all the inhabitants of Palestine, irrespective of race and religion." Palestinian Arabs, Christian as well as Muslim, had started to protest against the Mandate since the Peace Conference had ended. The Hashemite family of Emir Hussein had expected Syria and Palestine, as well as continuing to rule the Hejaz, and briefly controlled the former and the latter. However, France had laid its stake on Syria and Hussein was forced into exile by Prince Abdul Aziz Ibn Saud who founded Saudi Arabia. In 1921, the British made Emir Faisal King of Iraq, and his brother, as-Sayyid Abdullah king of Trans-Jordan. Both territories were carved from out of their mandated portion of the former Ottoman Empire. After 1920, Weizmann assumed leadership in the world Zionist movement, serving twice (1920-31, 1935-46) as president of the World Zionist Organization. In 1921, he worked with Albert Einstein for a fund-raiser to establish a Hebrew University in Jerusalem. Jewish migration into Palestine was at first encouraged by the British administration. However, in the face of civil unrest caused by a series of riots, this was curtailed. Jews continued to arrive, but illegally. The problem was that with financial aid from wealthy Jews overseas, the smaller Jewish community outstripped the larger Arab community economically, and in educational achievement. This inequality led to social unrest. The leaders of the Arab community were so emphatically opposed to a Jewish homeland that in practice Britain found its mandated authority difficult if not impossible to execute. Some Zionists, frustrated with the slow progress, started to take direct action against the British. Several commissions were established to find a solution. In 1936, Stanley Baldwin set up the Peele Commission following a series of clashes. Weizmann addressed the commission, which came up with the two-state solution. Territory in the North where Jews were already a majority would become a Jewish state, territory to the South would become the Arab state. Population transfer would be supervised between the two. The British mandate would effectively end except for continued administration of Jerusalem and its immediate environs, anticipating rival Muslim and Jewish claims on the sacred city. Weizmann was convinced that the Commission offered new hope to the Zionist movement. In 1939, Weizmann tried to prevent the publication of the White Paper, which restricted legal Jewish immigration. With the intervention of World War II, resolution of the mandate problem went on hold. 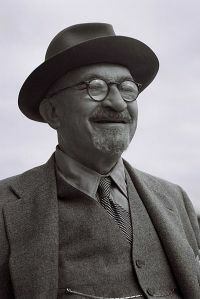 During the war, Weizmann was an honorary adviser to the British United Kingdom Ministry of Supply and did research on synthetic rubber and high-octane gasoline (formerly, Allied-controlled sources of rubber were largely inaccessible owing to Japanese occupation during World War II, giving rise to heightened interest in such innovations). Due to Adolf Hitler's attempt to murder all Jews in the Holocaust world-wide, although not Muslim or Arab, opinion became more sympathetic towards the creation of a Jewish homeland. Thousands of Jews were homeless and tried to migrate to Israel but British restriction were still in place. Realizing that its position was untenable and that with the demise of the League of Nations and the establishment of the United Nations the mandate needed renewal, Britain announced her intention to withdraw from Palestine and handed responsibility over to the new international body. The United Nations set up a commission, which also proposed a two-state solution with Jerusalem, at least initially, as a third entity under the UN itself. On November 29, 1947, the United Nations General Assembly passed Resolution 181 authorizing the establishment of an Arab and a Jewish state. The whole Muslim world voted against the plan. A commission was to work with the British until their departure. Britain refused to co-operate with a commission, and made no attempt to facilitate any process by which two states would emerge. The Arab League opposed the idea of a separate state. 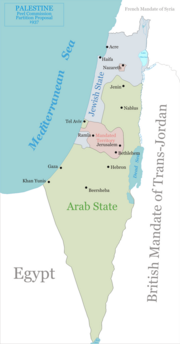 Subsequently, the Jewish leaders in Palestine decided to exercise self-determination in the territory where they were a majority, and which Resolution 181 indicated would be a Jewish state. The catastrophe which recently befell the Jewish people—the massacre of millions of Jews in Europe—was another clear demonstration of the urgency of solving the problem of its homelessness by re-establishing in Eretz-Israel the Jewish State, which would open the gates of the homeland wide to every Jew and confer upon the Jewish people the status of a fully privileged member of the comity of nations. Weizmann became the first President of Israel and remained in this post until his death. This was in large measure in recognition of the pivotal role he had played in persuading the international community to agree on a partition plan, although due to Arab opposition the Arab state was not created in 1949. Chaim Weizmann will be forever known as the first president of Israel. His nephew, Ezer Weizmann, also became president of Israel. His fame, however, lies not only in the political arena. At Rehovot, where he lived, Weizmann founded a research institute (now the Weizmann Institute of Science). Weizmann's success as a scientist and the success of the Institute he founded make him an iconic figure in the heritage of the Israeli scientific community today. The international Jewish youth group known as the Aleph Zadik Aleph have two chapters named after Chaim Weizmann, Chaim Weizmann AZA #360 (also known as CWAZA) in Portland, Oregon, and Chaim Weizmann AZA #1510 (also known as CW1510) in Omaha, Nebraska. In 2005, Weizmann was voted the 45th-greatest Israeli of all time, in a poll by the Israeli news website Ynet to determine whom the general public considered the 200 Greatest Israelis. ↑ Michael Weizmann Palestine: Information with Provenance (PIWP database). Retrieved January 30, 2019. ↑ Frances E. Hughes, Local Industry Owes Much to Weizmann Retrieved January 30, 2019. ↑ George Ingham Brown, The Big Bang: A History of Explosives (Sutton Publishing, 1998, ISBN 978-0750918787). ↑ Weizmann Institute, The Chaim Weizmann Laboratory Chaim Weizmann Lab, Department of Organic Chemistry. Retrieved January 30, 2019. ↑ Mid East Web, Proposal and map. Retrieved January 30, 2019. ↑ Mid East Web, The Palestine Mandate of the League of Nations. Retrieved January 30, 2019. ↑ UN General Assembly Resolution 181 United Nations. Retrieved January 30, 2019. ↑ Declaration of the Establishment of the State of Israel, May 14, 1948 Israel Ministry of Foreign Affairs. Retrieved January 30, 2019. ↑ גיא בניוביץ', הישראלי מספר 1: יצחק רבין – תרבות ובידור Ynet. Retrieved January 30, 2019. Dr. Chaim Weizmann; Questions and Answers About Dr. Chaim Weizmann in Observance of His 100th Anniversary. New York, NY: Dept. of Education and Culture, World Zionist Organization, American Section, 1974. Chaim Weizmann Of Israel Is Dead Obituary, The New York Times. This page was last modified on 30 January 2019, at 15:32.